MEDWAY, Mass. 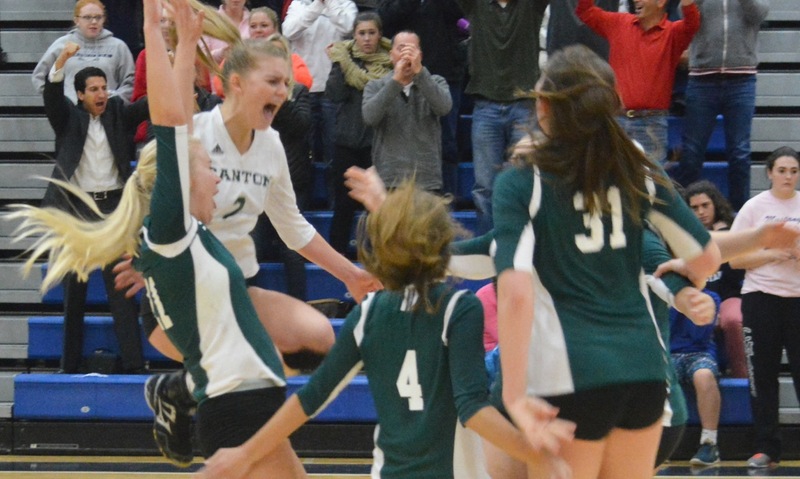 – Canton hopes that the popular saying, “defense wins championships,” applies to volleyball as it does in so many other sports. The Bulldogs may not be the biggest or the hardest hitting team in Div. 2 Central, but they can frustrate opponents with the relentless ability to get the ball back over the net. On Thursday night at Medway High, the Bulldogs showed off that defensive mentality against the host Mustangs and pulled out a 3-0 (25-19, 25-19, 25-20) win to advance to the Div. 2 Central final to face Westborough for the third time in the past four years. The Bulldogs were led in the match by Hockomock MVP Elizabeth Hamilton, who showed off her athleticism and positioning to pick up 14 digs along with her team-high 15 kills. Many times, Medway’s leading hitter Jess Jubb thought she had another kill only to have Hamilton or libero Olivia Devoe (11 digs) keep the play alive. The Bulldogs trailed only three times in the entire match (at 2-1 and 3-2 in the first set and 5-4 in the third), but Cawley did not feel like the Bulldogs were ever able to fully put away the hosts. “To me it felt like it was close the entire way,” she explained. “We had the lead I think pretty consistently but we’d get up three, four, five, and then they’d get back within one or two. Canton jumped out to a good lead in the first behind the hitting of Hamilton, who had six of her 15 kills in the opening set. Following back-to-back aces by Rye Verille, the Bulldogs led by as many as eight points at 19-11. A pair of aces by Medway’s Sydney Rice cut the lead down to four but Hamilton rose up to spike the comeback and Canton took the opening set. The second was very similar to the first with Sarah Reissfelder and Hamilton combining for three quick kills to give the Bulldogs the advantage. With the Medway crowd screaming and the Mustangs getting a little momentum, Hamilton dropped down to dig out what looked like a sure kill then hopped up and blasted a hit cross-court to make it 11-9. Casey Shea also had a big block for a point to make it 14-9 and continue extending the lead. Shea partnered with Verille and with Emma Murphy to give Canton a blocking matchup that could compete with the towering Jubb. 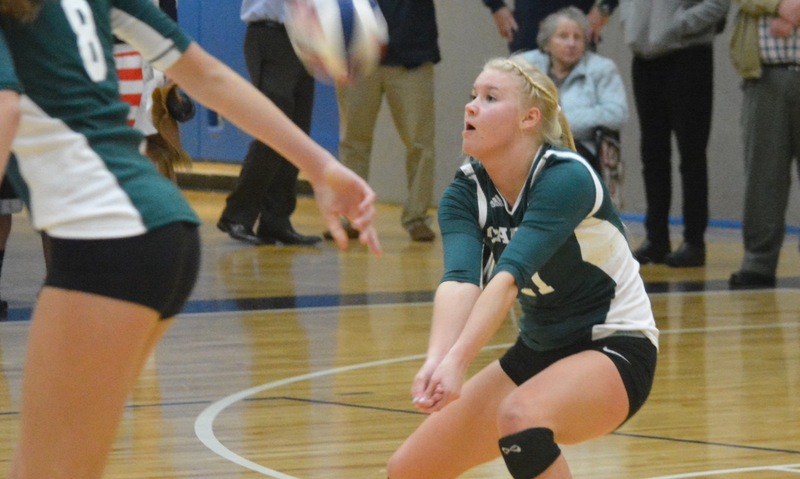 “Both combinations had some blocks on her tonight,” said Cawley. Verille would kill off the second set with an emphatic slam down the line to give Canton a comfortable 2-0 edge. The Mustangs, propelled by a vociferous home crowd, did not lay down and pushed the Bulldogs throughout the third set. Riana Pozsgai had a kill and then an ace to give Medway the 5-4 lead, but it would be the final lead of the match for the Mustangs, who never trailed by more than five in the closing set. Kehla Minkin came in and provided a spark with a pair of aces to to give Canton back the advantage. Hamilton followed with a tip for a point and setter Nicole Poole (22 assists and one block) rose up for a very rare block to make it 9-5. With a big smile, Poole excitedly turned to the bench making sure that it knew she had made the play. Medway continued to battle and keep it close. The final dagger may have come with Canton leading 19-18, when the ball skipped off Devoe and was heading into the stands. Hamilton raced over to keep it alive and Erika Lum was there with a heads up bump to get it over the net. The Mustangs hit it into the net and deflated as the point went to Canton. Shea would cap the win with a big block at the end to send the Bulldogs into the final. This is another trip to the sectional final for the Bulldogs, who have had their struggles when they reach this point. Canton has only once (2012) gotten out of the sectional and Cawley insisted that her team needed to enjoy the moment on Wednesday. Canton will face Westborough on Saturday night at 7 p.m. at Hudson High. FRANKLIN, Mass. 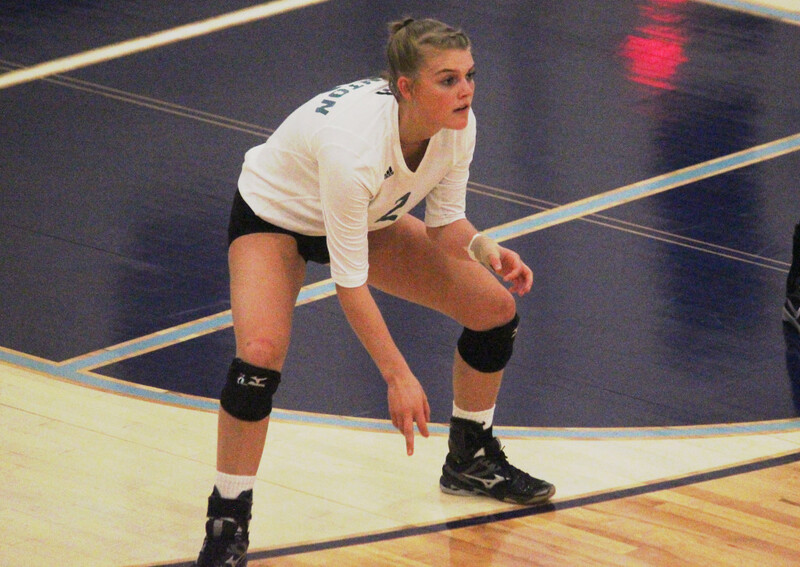 – In a battle of division leaders, it was the visiting Canton Bulldogs that jumped out to a big lead in the first set and went on to grind out wins in the next two for a sweep over Franklin, 3-0. Within a matter of minutes, Canton found themselves with a 10-1 lead on the Panthers and never looked back in the first set. A block kill from senior Elizabeth Hamilton made it 13-3 and then a kill from Emma Murphy just a few plays later made it 18-4, forcing Franklin to take its second timeout. The Panthers didn’t help themselves out in the first set with 16 unforced errors however, Canton did its part by being nearly perfect while serving. The Bulldogs made just one error while serving, which helped create their big lead. Canton took the first game 25-12. Franklin got off to a good start in the second set and after a kill from Aubrie Kutil made it 6-1, the Bulldogs were forced to call a timeout. The timeout worked as Canton was able to slowly work its way back into the second set. Franklin went up 12-9 but a kill from Sarah Reissfelder, a Franklin error and then a kill from Hamilton tied the game. Canton took the lead off a passing mistake and would never trail again. A perfect kill down the line from Hamilton was followed by an ace from Kehla Minkin and a kill from Murphy made it 19-15. Franklin got within three at 22-19 behind an ace from Dayna McCue but the Bulldogs were able to close out the second set, 25-20, to take a two set lead. The third set was by far the closest of the three with the largest lead from either side being four points. The teams were tied 11 times, including at 21, 23 and 24 apiece. Canton’s biggest lead early on was 9-7 but a pair of hitting errors tied the game. Franklin went up by four twice at 16-12 and 20-16 but a Hamilton kill and another Minkin ace closed the first gap and a pair of errors erased Franklin’s second lead. Trailing 23-21, a perfectly placed hit from Rye Verille was followed by yet another Hamilton to tie the game. The teams traded errors to get to a 24-24 tie. Hamilton got her ninth kill of the third set alone to give Canton the lead 25-24 and a hit out of play by Franklin gave Canton the win. Hamilton finished with a game-high 21 kills with 16 of them coming in the final two sets. The pairing of Hamilton and libero Olivia Devoe proved to be a strong tandem for serve receive and helped get the Bulldogs’ offense in motion. Devoe finished with 23 digs while Hamilton had 13 digs. Nicole Poole had 30 assists and seven digs while middles Murphy and Verille combined for 12 kills and a pair of kills. Canton (9-1, 9-1) will look to extend its seven game winning streak on Tuesday when they host Taunton. Franklin (9-2, 8-2) will look to bounce back when they hit the road on Tuesday at Stoughton.